A rendering of Tern Water's Smart Faucet. 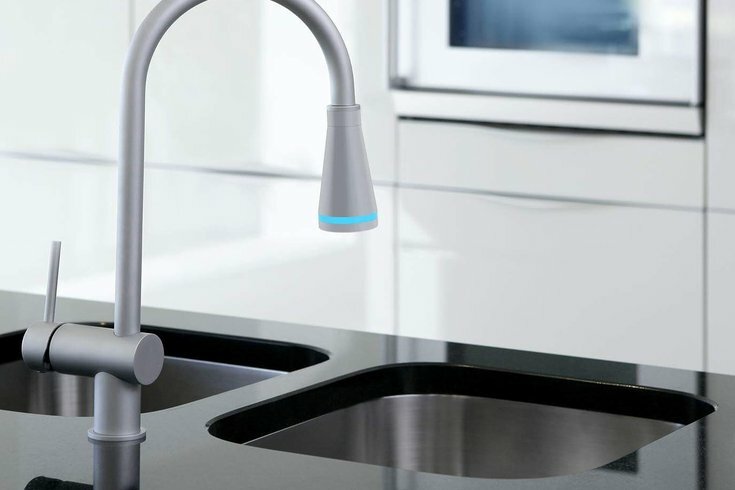 Make room in your portfolio of smart gadgets: The Smart Faucet is on its way. According to Technical.ly Philly, the faucet comes courtesy of Drexel students Mohamed Zerban, CEO, and Connor White, chief creative officer, who've branded their company Tern Water. At its core, the tool does exactly what you'd expect it to -- that is, filter your water. It uses carbon shells and particles to filter out lead, chlorine and mercury. But the hook is that it also issues real-time data of water consumption and its environmental impact, estimates water quality and not only lets you know when to replace the filter but orders a new one when you need it. As one might imagine, there's no LCD screen installed on the faucet to let you know all this; instead, the faucet transmits data to a Tern app through built-in sensors. Zerban told Technical.ly Philly he was inspired to make the product after learning more about the city's water system through a Drexel co-op with the Philadelphia Water Department. Seeing the city's older infrastructure for water filtration, he said, inspired him to problem solve and put power back in the hands of homeowners. White, meanwhile, brought on board product design skills from his work at Shift Design (best known for designing Philly parklets). The product has been in development since Spring 2014. Tern is currently crowdfunding. The faucet comes on the back of the water crisis in Flint, Michigan, which has prompted extra attention on the Philadelphia Water Department and the local water supply. For its part, the department claims comparisons to Flint's crisis are "highly misleading." Though the Smart Faucet filter is posed as a preventive solution to crises like Flint, it's worth noting that lead levels in Flint are too high to be filtered at all. Its social impact will also depend on price points, which are still to be announced.